Various Surgical Mesh Types are Causing Injuries After Surgery. A large number of individuals throughout the United States have reported suffering severe and debilitating problems following Ethicon Physiomesh® hernia mesh surgery. In fact, thousands of lawsuits are expected to be filed. Physiomesh is a flexible composite mesh that are used to repair hernias and reinforce weaknesses in the abdominal wall which could cause hernias. Surgeons implant the mesh over an opening or weak spot on the abdominal wall. The idea is that the mesh creates a strong barrier to prevent your internal organs from squeezing through. However, the failure rates for Ethicon Physiomesh mesh appear to be unreasonably high, potentially resulting in the need for revision surgery and leaving patients with permanent and debilitating health problems. Ethicon Physiomesh were introduced to the medical device market using the 510(k) FDA approval system. This system allows companies to introduce medical devices without rigorous pre-market research and studies. Both manufacturers only had to demonstrate that it was “substantially equivalent” to a previously approved hernia mesh system. As a result, the manufacturer was not required to conduct thorough testing or research to establish whether users may face an unreasonable risk of problems following Physiomesh hernia repair. As the 500-pound gorilla of the healthcare world, Johnson & Johnson has flung its weight around and gotten its way with the Ethicon Physiomesh for years. But now the tide is turning. This particular hernia mesh has been linked not only to severe pain, but to sexual dysfunction and testicular pain. One of the most common types of hernias is the inguinal hernia, which occurs in the groin area. Most of the people who suffer from inguinal hernias are men. More than that, the “sealed” edge of the 3DMax hernia mesh has an unfortunate tendency to tear, and those rough edges can increase the likelihood of post-surgical complications. There are many different hernia mesh devices on the market, and each of them differs from the others in small but significant ways. 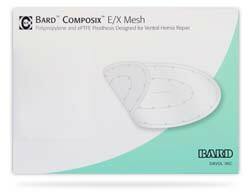 In the case of the Bard Composix and Bard Composix EX hernia mesh devices, the distinguishing characteristic is very simple: they have two layers of material. One layer of all types of Composix hernia mesh is polypropylene – the same kind of plastic used to make fishing line and synthetic carpets. 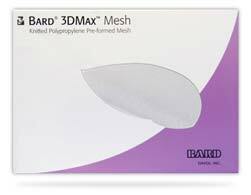 According to Bard Davol, the maker of the Composix hernia meshes, the polypropylene side of the mesh promotes tissue growth at the site of the surgical incision over which it is placed. The other side of the Composix hernia mesh contains a “permanent submicronic ePTFE barrier.” OK, so what’s ePTFE? You mean you didn’t know? ePTFE is an abbreviation for “expanded polytetrafluoroethylene,” which is a polymer that has extremely tiny pores. You may know it as the key component of Gore-Tex, a substance that’s now in everything from ski jackets to dental floss to NASA equipment. The purpose of the ePTFE layer of the Composix hernia mesh is to minimize the possibility that the mesh will adhere to the incision. Just about every hernia mesh product is made of polypropylene, a plastic with a million and one uses. Many of us know it as fishing line. Polypropylene itself can present problems, as it can decay within the body and “melt” into internal tissues and organs. Pretty nasty stuff. But the Atrium C-QUR is even more dangerous than most other hernia meshes, because the polypropylene that it’s made of is coated with Omega-3 fatty acid fish oil gel. Fish oil is supposed to give the Atrium C-QUR an advantage over other hernia mesh products, because the oil allegedly provides an anti-inflammatory barrier. When it comes into contact with internal tissues, however, fish oil can have exactly the opposite effect. Clinical studies have found that the Omega-3 fatty acid fish oil that coats the Atrium C-QUR hernia mesh has been linked with intense inflammation of the tissue surrounding the implant. Even worse, the fish oil can form a barrier that prevents the flow of bodily fluids, a problem that can lead to abscesses and further, deeper infection. Omega-3 fatty acid fish oils may have some health benefits, but only when digested by powerful stomach acids. If “set loose” in the body, like the fish oil in the Atrium C-QUR hernia mesh, fish oil can cause serious infection, and can make existing infections even worse. This device – which was intended to secure internal organs and help with healing – can in fact perforate internal organs, “melt” into them, or otherwise cause inflammation and infection. In some patients, fish oil can cause allergic reactions, which can complicate surgical procedures and patients’ abilities to recover from them. In many patients, the Atrium C-QUR hernia mesh has been linked with chronic pain, as well. Atrium Medical Corporation, the pharmaceutical products company that designed, manufactures, and sells the C-QUR hernia mesh, received all kinds of warning signs that its product could cause grievous bodily harm. Atrium simply chose to ignore and conceal those warning signs in the name of profit. The biggest, loudest warning came in 2013, when complaints had mounted up so much that Atrium was forced to issue a recall – for C-QUR’s packaging. After approximately 1500 C-QUR devices were found to adhere to their packaging in elevated humidity, the company decided that the packaging was the problem. It wasn’t. The attorneys at TheLawFirm.com believe that Case of the Sticky Packaging was a sufficiently serious indication that the Atrium C-QUR hernia mesh could pose significant health problems when subjected to the moist conditions inside the human body. Further, the attorneys at TheLawFirm.com believe that Atrium was negligent in failing to recall the product itself (not just its packaging), and in failing to alert patients and doctors to the potential health hazards of the C-QUR hernia mesh. The C-Qur (pronounced “secure”) Hernia Mesh is made by Atrium. There are three main problems alleged. The first problem with this mesh is that it’s made with polypropylene plastic that can cause a rejection response when placed in the body. This response can cause the mesh to bind beyond the muscle wall and bind to the intestines and other organs. The second problem with this hernia mesh is that it contains a flexible metal ring that holds the mesh in a circle. This ring is prone to breaking. The third problem with this hernia mesh is that it’s associated with a high rate of infections. The medical reason thought to be the cause is because the coating of the hernia mesh prevents fluid from escaping. It allows fluid to pool and remain dormant for months, becoming a breeding ground for bacteria. Defendants failed to provide adequate instructions and warnings. Plaintiffs argue that the C-Qur Hernia Mesh was never tested for safety by the FDA. There were, however, a series of warnings and recalls. The first warning came in 2012 when the FDA issued a warning letter to Atrium, saying their sterilization process was defective. The FDA found 35 separate complaints of human hair being embedded into the mesh. There were multiple instances of C-Qur infections that the company failed to report. There was a recall that took place on August 9, 2013. Atrium Medical recalled 95,286 units because the coated mesh could adhere to the inner packaging when exposed to high humidity. This ‘recall’ was in the form of a letter to doctors notifying them of the “stickiness” problem. Finally, there was a FDA injunction against the company stopping them from producing the mesh, and that took place on Feb 4, 2015. It was followed up by more than 10 inspections by FDA investigators, who found major violations in the quality system regulation, the medical device reporting regulation, and the correction and removal regulation. Finally, Plaintiffs point to scientific articles finding some hernia mesh causes an increase in adhesions. Additionally, these articles found that the C-Qur hernia mesh caused more infections than all the other brands combined. The Parietex hernia mesh, which was designed and manufactured by the major medical-supplies corporation Covidien, is a case study in a company taking a bad, dangerous product and, by redesigning it, making it even worse and more dangerous. It’s products like the Parietex hernia mesh that makes the attorneys at TheLawFirm.com shake their heads in regret and astonishment. How could it ever have occurred to Covidien that the Parietex hernia mesh wouldn’t spark health problems and lawsuits? The first Parietex hernia mesh device was made of polyester, whereas most other hernia mesh products are made of a plastic called polypropylene. Polypropylene has a dangerous tendency to dissolve into internal tissue, making it a main cause of many of the medical problems that hernia mesh patients have suffered. So making a hernia mesh from a material other than polypropylene sounds like a good idea. Except that it’s not. Polyester – yes, the same material used in all those pants in the 1970s – also has a tendency to deteriorate, shrink, and deform when inside human body. Those structural problems with the Parietex hernia mesh can cause a number of serious health issues, such as adhesions, infections, and compromised internal organs. The tendency of the Covidien Parietex hernia mesh to shrink poses particularly nasty problems. When the Parietex shrinks, it often tugs on the tissue to which it is attached. Not only can the mesh tear when it shrinks, but it can cause severe pain when it yanks on the internal organs. If the Parietex hernia mesh shrinks sufficiently small, it can become detached from the site where it’s been implanted, and can actually migrate throughout the body to places where it can do even more serious damage. Covidien’s redesign of this potentially injurious device made matters even worse. The Parietex Composite hernia mesh, or PCO, is made of that same polyester, but it is coated with a “barrier” of collagen. Collagen is a protein found in connective tissue all throughout the body, and it’s used in many medical and cosmetic products. The purpose of the PCO’s collagen barrier was to prevent the mesh from adhering to internal tissues. In this case, however, collagen didn’t help at all. In fact, it made things worse. 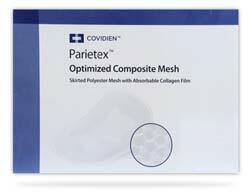 After the Covidien Parietex Composite hernia mesh is implanted, the collagen layer dissolves very quickly, so it’s not even around long enough to prevent the mesh’s polyester from adhering to internal tissues and organs. Once the collagen is gone, patients are stuck with the same old polyester mesh with the potentially hazardous tendency to rip, to tear at and cause pain in internal tissues, and to migrate to other locations in the body. Why is this worse? Because patients were promised a safer product, and instead received the same old thing – now with an utterly useless coating. Thanks, Covidien. So Covidien went back to the drawing board and came up with a device that is so bad and so dangerous that it makes you wonder if they wouldn’t have had greater success in the Medieval Era, when they would surely have been every cruel tyrant’s preferred maker of torture devices. The Parietex ProGrip and the Parietex Plug and Patch System are hernia mesh products that amplify all the bad things about the other Parietex products. These devices are, once again, made of polyester, a fabric that has a tendency to shrink, tear, and deform. This time, the polyester is woven together with a polylactic acid layer (PLA), which, once again, was supposed to prevent shrinkage. It didn’t work. The Parietex ProGrip is particularly noted for causing pain in the patients in whom it has been implanted. The ProGrip is a “self-fixating” mesh: it has thousands of tiny hooks that are intended to keep the hernia mesh in place. The problem is that the polyester of the mesh still shrinks. And when it shrinks, those thousands of tiny hooks yank and tug on the tissue to which they are attached, causing severe pain. The hooks are effective, though. They’re so good at keeping the ProGrip in place that the thing just won’t let go. But since it causes such severe pain, surgery is often necessary to remove it. Sometimes multiple surgeries. The attorneys at TheLawFirm.com believe that Parietex hernia mesh products are among the worst and most dangerous hernia mesh products ever made. Their design flaws mean that Parietex hernia mesh products cause far more harm than good. Like most other hernia mesh devices, the Bard Davol Sepramesh (also known as the Ventralex ST hernia mesh) is chiefly made from polypropylene plastic – the same stuff they use to make fishing line and synthetic carpet fibers. That polypropylene structure means that the Sepramesh is no safer than any other hernia mesh device, because polypropylene has been linked to a number of serious health problems: infection, hematomas, even organ failure. But the makers of the Sepramesh had to make their product just a little bit different, so they added a “hydrogel safety coating.” That coating is supposed to protect against infection, and to prevent the mesh from adhering to body tissue. The “hydrogel safety coating” on the Sepramesh has been linked to other serious health problems. It can cause inflammation. It can cause infection. And it can even cause the mesh device to do exactly what the coating is supposed to prevent: adhere painfully – and potentially life-threateningly – to internal tissues and organs. It would have been nice if Bard Davol had made the Sepramesh stand out by being safer or more effective, but, unfortunately, that’s not the case. 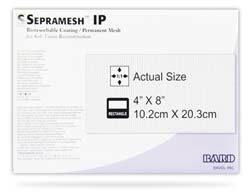 So, now, the Sepramesh is just another product on the shelf – one of the dozens of hernia mesh products that differ ever so slightly from one another, but, when you get down to it, are all pretty much the same. The makers of hernia mesh devices might advertise their “hydrogel safety coating,” but, no matter what kind of hernia mesh you’ve had surgically implanted, you still run the risk of infection, complications, and further surgeries. 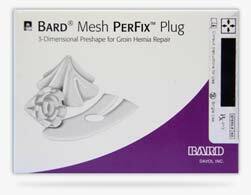 The PerFix Plug hernia mesh device – one of the many hernia mesh products manufactured by medical-device giant Bard Davol – really only has one major weakness. But it’s a killer – literally. The problem with the PerFix Plug is a structural one. Like nearly every other hernia mesh device, the PerFix is made of polypropylene, a cheap, commonplace plastic that’s used to make everything from fishing line to synthetic carpet fiber. The danger of polypropylene is that it can deteriorate once implanted into the human body, and can even dissolve to the point that it effectively melts into internal tissues and organs. When that happens, it can’t be removed, and it can cause severe health problems, like infection, severe pain, and even organ failure. The problem with the PerFix Plug is that its design maximizes the likelihood that its polypropylene will malfunction, dissolve, and cause major health issues. You could hardly have found a less advantageous design for hernia mesh if you’d hired the devil’s own architects. The PerFix is just a bare polypropylene mesh that’s been twisted into a flared, pluglike shape. That’s it. But that bare mesh – and the folds and curved surfaces it contains – is in exactly the wrong shape if the purpose of the mesh is to contain internal organs and prevent against infection. The PerFix does exactly the opposite: its many, tiny holes and numerous folds encourage nerve tissue to grow right through them. The reason that that kind of nerve growth is a problem has to do with the inevitable deterioration of the polypropylene fabric of the PerFix Plug. When – not if, but when – the plastic decays, the nerves that are caught in the mesh get tugged and stretched. And that can cause excruciating pain – pain so bad that it may not even be treatable. Even worse, because so many PerFix Plugs are implanted in men after surgery for an inguinal (groin) hernia, the mesh’s decay can cause severe testicular trauma. Studies have shown that the PerFix Plug can cause such severe nerve damage that patients’ testicles must be removed. The sexual dysfunction that can result from this type of complication is simply piling insult atop injury – literally. Remember: these devices are supposed to help with healing, not cause further health problems. What makes the whole thing worse – in the case of the PerFix, as well as with every other hernia mesh device – is that the manufacturer of the device knew full well that its design could cause serious health complications. But they withheld that information from patients and doctors, marketed their products aggressively, and now here we are. The Kugel hernia mesh device holds a special place in the hernia mesh Hall of Shame. It was recalled not one, not two, but three times by its manufacturer, Bard Davol: once in 2005, once in 2006, once in 2007. Yet the Kugel hernia mesh is still on the market, and is still being used in hernia operations. Simple answer: Because there’s a lot of money to be made by selling hernia mesh devices – even defective hernia mesh devices that can cause major health problems. That’s Big Pharma at work. Bard Davol knows perfectly well that the Kugel hernia mesh is a dangerous product. (See “three separate recalls,” above.) But the company continues to maintain – even in the face of a mountain of clinical evidence – that the product is safe and secure. At TheLawFirm.com, we believe that the Kugel hernia mesh is anything but safe and secure. We believe it can cause significant health problems in anyone who’s had it implanted, and, furthermore, we believe that those people are entitled to significant financial compensation. The Kugel hernia mesh is shaped like an oval, with a ring in the middle that helps the patch keep its shape. Unfortunately, nothing helps the ring itself keep its shape. The ring in the middle of the Kugel hernia mesh device has a tendency to break. When that happens, patients experience a much higher risk of the device perforating their bowels. That’s right – the Kugel hernia mesh can create holes in your intestines. On those three occasions when Bard Davol recalled the Kugel device, the company insisted that only certain lots of the product had rings that tended to break. We believe that every Kugel hernia mesh device should be recalled. That’s because every Kugel hernia mesh device is made of polypropylene, a cheap plastic that shrinks and decays when inside the human body. When the polypropylene of the Kugel hernia mesh inevitably shrinks and deteriorates inside the body, it exerts more and more pressure on the device’s inner ring. Then – pop! The ring breaks, and patients can suffer from perforated bowels. The ring is dangerous, but the ring isn’t really the problem. The problem is the cheap polypropylene plastic that the Kugel hernia mesh is made of. And, of course, the real problem is the fact that even though Bard Davol knew about the dangers of the Kugel hernia mesh, the company continues to manufacture, market, and sell dangerous “healthcare” products. We believe that this is more than sufficient grounds for legal action. If you believe you have a case against the makers of the Kugel hernia mesh device, contact TheLawFirm.com. We want to help you get the compensation you deserve. Contact us for a free consultation. We can help you. Bard Davol, Inc., is a gigantic medical-supplies business. The corporation is based in Providence, Rhode Island, and has been manufacturing and selling medical and surgical supplies since 1874. So the company has quite a lot of experience developing, testing, marketing, and selling products for medical and surgical procedures. As one of the leading manufacturers of hernia mesh devices, Bard Davol, Inc., knows something about the potential health hazards of these products. So let’s let Bard Davol, Inc., take the lead in explaining how its Visilex hernia mesh can pose serious health issues in the patients in who it has been surgically implanted. Adverse Reactions associated with surgical mesh may include but are not limited to seroma, adhesion, hematoma, pain, infection, inflammation, extrusion, erosion, migration, fistula formation and srecurrence of the hernia or soft tissue defect. That sounds pretty serious, Bard Davol. Let’s go through those one by one. A seroma is a pocket of clear fluid that can develop in the body after a surgical procedure. Most of that fluid is blood plasma. Seromas are often harmless, but they can linger in the body for as long as years, and can harden into little nodes, which sometimes require surgical removal. Often, seromas are breeding grounds for the bacteria that can cause infection. If a seroma ruptures, infectious bacteria can spill out into the body cavity, where they can cause serious health problems. Strike one against the Bard Davol Visilex hernia mesh. When Bard Davol, Inc., refers to the Visilex having an “adhesion” problem, they’re making a serious health hazard sound no worse than the roll of tape you keep in your office drawer. All hernia mesh devices can cause complications by adhering to internal tissues and organs. The devices can dissolve into body tissues, effectively “melting” into them. When that happens, hernia mesh can be impossible to remove, and it can cause inflammation and infection (more on those subjects below). Hernia mesh adhesion is a nasty business. 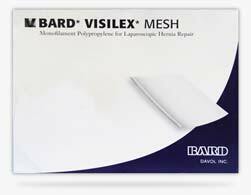 Strike two against the Bard Davol Visilex hernia mesh. “Hematoma” is the medical term for bruising. Hematomas develop when blood vessels rupture, releasing blood into the body, where it collects. In most cases, hematomas heal themselves as the blood is slowly reabsorbed into the body. In most cases, hematomas are tender and painful. In some cases, hematomas can restrict movement and can cause lumps which may require surgical removal. Strike three against the Bard Davol Visilex hernia mesh. Inning over. No surgical procedure is enjoyable. We expect surgery itself to cause discomfort and pain. But when a surgically implanted device itself causes pain, that’s a problem. On the advice of our doctors, we undergo surgery to remove pain, not to increase the likelihood of pain. Strike four against the Bard Davol Visilex hernia mesh. The “adhesion” mentioned above is the main cause of infection with the Visilex hernia mesh. The Visilex can get absorbed into body organs and tissues – it actually becomes a part of the body, and is often impossible to remove, even with the most advanced surgical techniques. Since, of course, the Visilex is not a part of the body itself – it’s made of polypropylene plastic – the body regards it as a foreign entity, and summons all the defenses in the immune system to combat it. That’s when infection can set in – just like when you ignore that splinter in your heel for too long. The Visilex is supposed to help, not hurt. Strike five against the Bard Davol Visilex hernia mesh. Inflammation is less serious than infection, but that doesn’t mean it’s any less painful. An inflamed organ or tissue can cause serious pain or discomfort. Strike six against the Bard Davol Visilex hernia mesh. Another side retired. As the polypropylene plastic that makes up the Visilex hernia mesh shrinks, deforms, and dissolves, so do the tiny gaps in the mesh. Body tissue can get pressed and squeezed – extruded, that is – through those tiny gaps. Imagine taking a piece of chicken wire and pressing it against your thigh. Now press harder. Harder. Harder. That hurts pretty bad, right? That’s exactly what’s happening, on a microscopic scale, during the process of “extrusion” with the Visilex hernia mesh. Strike seven against the Bard Davol Visilex hernia mesh. “Erosion” sounds like a natural process. River beds erode. Cliffsides erode. Even the Grand Canyon was formed by erosion. Yet the erosion associated with the Visilex hernia mesh is anything but natural. In this case, “erosion” means that the plastic that comprises the Visilex mesh can actually dissolve and melt into body tissue. Patients who have been implanted with the Visilex actually have melted – excuse us, eroded – plastic inside their bodies. We believe that melted plastic has no business being inside the body. Strike eight against the Bard Davol Visilex hernia mesh. Oh, how nice – migration. Like Canada geese and monarch butterflies during the change of seasons. The thing is, though, that, in order for a hernia mesh to do its job, it has to stay in one place. The Visilex hernia mesh is supposed to keep organs and tissues in place at the site of a surgical procedure. But if the Visilex decides to “migrate” to another part of the body, it can cause major problems. First, it’s not present at the site where it’s supposed to do its job of keeping organs in place. Second, it can get loose in the body, where it can get tangled up with blood vessels, organs, and tissues, thereby causing all kinds of unpredictable and potentially life-threatening complications. Strike nine against the Bard Davol Visilex hernia mesh. Three innings have passed, and Team Visilex hasn’t even managed a walk or a foul tip. A fistula is an unnatural “passageway” that forms between two bodily organs, or between an organ and the outside world. Think of the formation of a fistula in the body like the construction of a hallway between two rooms in the house – except it’s a hallway that no one wanted, that serves no purpose, and that can compromise the structural integrity of the whole building. Fistulas can easily develop infections. Fistulas can cause swelling, discomfort, and pain. Fistulas can require surgery. Depending on where they are located, fistulas can be fatal. Strike ten against the Bard Davol Visilex hernia mesh. Here’s the worst problem of all with the Visilex hernia mesh: It may very well cause the problem that it was supposed to solve. The Visilex hernia mesh – after possibly causing infection, erosion, fistulas, and all these other health complication – may in fact wind up serving absolutely no purpose whatsoever. It can cause the hernia is was supposed to contain. There could not be a more pointless, negative outcome. Strike eleven against the Bard Davol Visilex hernia mesh. In fact, let’s call it strike two million. There’s little that’s good about the Visilex hernia mesh, but there’s a lot that’s very, very bad. If you’ve had a Visilex hernia mesh surgically implanted, you may be at risk – and you may be entitled to significant financial compensation. To find out what you can do about it, contact TheLawFirm.com. Gore DualMesh is a surgical mesh that, like similar products, is designed to be implanted into a patient’s body to reinforce weak or damaged tissue, most frequently in the case of hernias but also in other instances where soft tissue requires repair. According to Gore, what sets DualMesh apart from other surgical mesh products is its two-sided design, with one side preventing tissue attachment while the other side supports tissue ingrowth and incorporation. Gore, the same company that brought us Gore-Tex—the water-resistant materials frequently used in hiking boots and other outdoor gear—heralds its DualMesh Biomaterial as “the first dual-surface material that encourages host tissue ingrowth while minimizing tissue attachment.” It is used to repair hernias and other soft tissue damage, as well as in fascial reconstruction, temporary bridging TRAM flap procedures, and chest wall reconstruction. In addition to DualMesh, Gore offers DualMesh Plus, which contains silver carbonate and chlorhexidine diacetate, purportedly for additional antimicrobial protection, which Gore markets as helping to stave off post-surgery infections for up to ten days. However, as noted by the author of Laparoscopic Hernia Surgery: An Operative Guide, “Long-term data on the benefits of impregnating these substances [silver and chlorhexidine] into the product [DualMesh] are difficult to document due to the low rate of infection that is associated with laparoscopic hernioplasty.” In other words, the inclusion of these antimicrobial elements is largely a solution in search of a problem, the efficacy of which cannot even be adequately determined. ePTFE—the material Gore uses in its DualMesh products—is just one substance used to make surgical mesh. Other makers of surgical mesh manufacture their products from composite materials or from a collagen matrix. Manufacturers using a composite substance include C.R. Bard (Composix, Composix EX), Genzyme (Sepramesh), and Brennen (Glucamesh, Glucatex 3D). Surgical meshes utilizing a collagen matrix are produced by manufacturers such as Cook Surgical (Surgisis ES, Surgisis Gold), Organogenesis (FortaPerm, FortaGen), and Lifecell (Alloderm). Each of these products is associated with its own potential risks and benefits, so if you require a surgical mesh implant, it is important to educate yourself as much as possible and to discuss all of your potential options with your healthcare professional. And, if you should ever find yourself or a loved one injured by a dangerous medical device, it is important to contact the experienced team of attorneys at TheLawFirm.com right away for a free legal consultation. In order to expedite government approval of new medical devices and to bypass certain premarketing requirements, medical device makers often will argue to the U.S. Food and Drug Administration (FDA) that a new device is, in fact, “substantially equivalent” to one or several FDA-approved devices already on the market. Gore has used this approach with several iterations of its DualMesh products. However, one would be excused for not knowing this from medical device makers’ multi-million-dollar ad campaigns, which are intent on selling consumers on the “revolutionary” and “new” aspects of each device they roll out. Are Gore DualMesh Used For Hernia Repair? 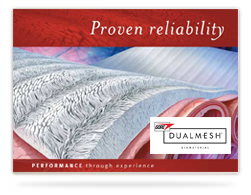 According to the United States Food and Drug Administration (US FDA), Gore DualMesh and DualMesh Plus are suitable for permanent implantation to repair conditions involving soft-tissue damage, such as hernias. Unfortunately, for all of Gore’s claims about the revolutionary nature of DualMesh, it appears to expose patients to many of the same risks and potential complications as other surgical mesh products. Going back over a decade, the United States Food and Drug Administration (FDA) has been receiving reports from patients complaining about side effects they attribute to their surgically installed Gore DualMesh. These patients’ symptoms have included serious infections, obstruction of the bowels, severe abdominal pain, and inflammation. In some cases, patients reported these symptoms as having been so intense as to require hospitalization.